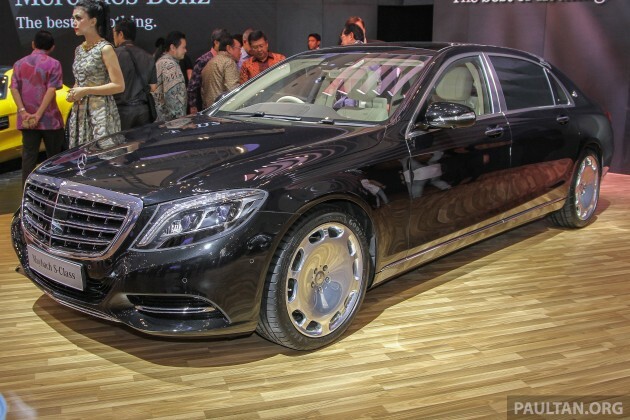 Following its recent debut in Thailand, the Mercedes-Maybach S-Class S500 has been introduced to a second country in the region -the 2015 Gaikindo Indonesia International Auto Show (GIIAS) saw the model on display, and we managed to enough photos to get a nice gallery post going. The luxury limo is priced at Rp 5.34 billion in the republic, which translates to just over RM1.6 million – that’s a shade cheaper than in Thailand, where it goes for 16.9 million baht (RM1.88 million). The S500 sits below the S600, which was announced as the sub-brand’s first model last year – the latter made its debut at the Los Angeles and Guangzhou shows in November. The car measures in at 5,453 mm long, 1,899 mm wide and 1,498 mm tall, and tips the scales at 2,220 kg. It’s powered by a 4.6 litre twin-turbo V8 offering 455 hp at 5,250 to 5.500 rpm and 700 Nm of twist from 1,800 to 3,500 rpm. The unit is paired with a 9G-Tronic nine-speed automatic transmission. Performance figures include a 0-100 km/h sprint time of 5.0 seconds and a 250 km/h top speed. and rated fuel consumption is 8.9 litres per 100 km (combined). As you’d expect, the Maybach S500 – which rides on 20-inch forged wheels – is comprehensively loaded with features and kit. There’s Magic Body Control for starters, and no less than nine exterior colours as well as five upholstery and five trim options to pick from. Standard equipment in the Indonesian model includes designo brown sunburst high-glossy myrtle wood trim (that’s quite a mouthful), an Exclusive package and Rear Seat Comfort package for the interior. Also on, a Burmester high-end 3D surround sound system, folding tables in the rear, seat heating, tinted and IR-reflecting laminated glass as well as a panoramic sunroof. Tech bits include Night Vision Assist Plus, Active Park Assist, Driving Assistance Package Plus, Distronic Plus with Steer Control as well as Stop & Go Pilot. Now that Thailand and Indonesia have introduced the car, will we see it making its way here? The new Mercedes-Maybach would surely be easier to digest from a pricing point-of-view compared to its defunct Maybach predecessors, the hilariously expensive Zeppelin 57 and 62.
eh u forgot to put the price in malaysian ringgit. Wanna see more Maybach S500 on the road? Buy Proton then. Their cronies and senior management are waiting for your donation. You think they would drive a Proton? Don’t be silly. Someone up north has this penned as his next official car after next GE. My wife said she wants one. Please donate us. Not expensive only, RM 2 million estimated minimum price. Don’t Buy This Car. The 20″ Tyre Rim do not suit Asian Country road. Bought one S 400 with a Tyre Rim crack and cannot claim from C&C. This car has no RV, only suits old men. Better to buy Lexus ES like me.